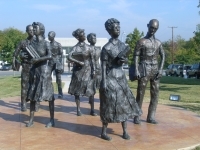 After a ruling by the US Supreme Court that segregated schools were unconstitutional in 1954, a group of African-American students known as the 'Little Rock Nine' were enrolled in Little Rock Central High School in 1957, much to the dismay of their fellow all-white classmates. The move was considered to be one of the most important events in the African-American Civil Rights Movement. On 4 September 1957, several segregationist councils held protests at the school to deny the new black students entry, and angry mobs spat at and verbally abused the nine teenagers as they made their way to school. On 25 September, the Little Rock Nine were finally admitted to the school under the protection of the US Army, with 1,000 US paratroopers protecting them from segregationist whites, but they still endured a full year of physical, verbal and emotional abuse from fellow white students. Nevertheless, on 27 May 1958, Earnest Green became the first black student to graduate from the school. Finally, in 1964 the Civil Rights Law prohibited racial discrimination in education, employment or in public places. Little Rock Central High School still functions as part of the Little Rock School District, but is home to a National Historic Site that houses a Civil Rights Museum.